Castelli's Trasparente 3 Long Sleeve Wind Soft Shell fits like a jersey but protects like a jacket. Winstopper® X-Lite Plus front panels and sleeves are windproof and water-resistant for defense against cold, damp weather, but the back is constructed with Castelli's Warmer fabric to minimize bulk while providing excellent breathability. A full-length YKK® Camlock zipper makes adjustment easy on the road, and a zippered chest-pocket plus three standard jersey pockets provide plenty of room for storage while riding. Features an elastic waist with reflective detailing on the rear hem for enhanced visibility. Available in multiple colors. I've been pairing this jacket up with the Omloop Thermal Bib Short to get in some early spring rides in New England. I'll typically wear a long sleeve base layer underneath for added warmth, but the wind protection and thermal layer are amazing. I went with a medium weight base layer for a 25 degree morning commute and stayed warm through the 11 mile ride into Boston. Having the chest pocket is an added bonus for carrying phone/building badge/keys. A great standalone jersey for those cool fall and spring days. Now that winter is here I use it as a warmth layer. Breathes well so you won't sweat and keeps you dry. Make sure you order a size larger than normal as this jersey fits very tight. I am a road cyclist but not much in cold weather. I wanted to upgrade my winter gear and this was my second Castelli purchase. I am 6 1 180-85 during the winter so I went with the XXL. It fits well over a base layer and provides good protection from the cold. 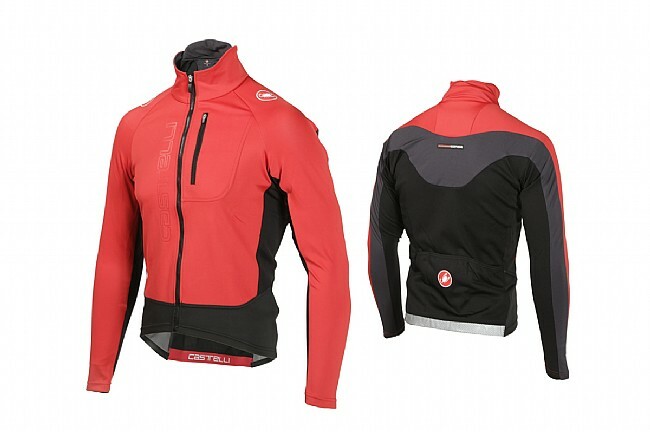 My core gets cold easily so I added a Castelli Expresso jacket 3X for colder days. I was surprised that these garments come from a variety of countries but not Italy. Regardless they are well made. They do fit snug so I air dry them so they will last. This is the best piece of Castelli gear I've purchased. Could be either a jersey or jacket Great to wear alone as a fall long sleeve jersey or with a base layer as a jacket for colder rides. The windstop on the front and sleeves is light and stretchy yet does an excellent job keeping wind out, while the soft shell material on the back helps to vent and wick moisture. The higher collar is nice on cold days! I've worn this in the mid 40s with a Craft warm base layer and been warm and comfortable or in the 50's without the base layer and I'm perfectly comfortable. Do keep in mind that this is designed to be more of a snugform fit so make sure as with all Castelli products to size up 1 to 2 sizes. (especially if you intend to wear a base layer of any thickness). I am 511 165lbs and went with extra large which fits well. This one of my favorite pieces of kit for it versatility. It works great by itself as a fall and spring jersey jacket. By putting a jersey or base layer underneath I have worn this into the high 40 degrees. I also use it as part of a layering system along with a Castelli Gabba 2 convertible jacket into the 30 degree temps with rain. The jacket itself will keep me dry in a shower, but will soak through in sustained rain. Even wet, it is very windproof, which goes a long way to keep you warm. One of my favorite things is it fits tight to your body. So, no more feeling like you have a parachute on when riding ! As with all Castelli, this is not cheap, but for the versatility and when caught on sale here at BTD, it's still a really good value. When I crashed in it a tore one of the sleeves, I ordered a new one right away since I will not ride without it certain times of the year. The old one now serves as part of my mountain bike gear, so still put to good use. Also, with most Castelli, go at least size up from most brands, and enjoy a great jacket. WARNING - I usually wear a Medium or occasionally Large Jersey. I ordered this in LARGE. I could not even close the zipper. the sleeves were 2 too short and the body length was too short. Sizing is ridiculously small. This jersey is my go to for fall, winter and early spring rides. Works well for a wide range of temperatures and has great wind protection without overheating, and layers well when it gets colder or you hit some rain. Castelli also did some small improvements over the previous version with a more robust zipper, better fit and collar. Comfortable jersey that works well in cool, windy conditions. When the windchill lowers the effective temperature this is a good choice. Have no experienced overheating when the wind dies down or riding through a sheltered area. Castelli quality for sure. I have two of these,Excellent wind protection in cool weather. Style and comfort once you figure out sizing ,runs small. Versatile protection that screams Castelli quality. Riding in the Pacific Northwest most of the year requires a bit of forethought in terms of clothing. It can be sunny and 60 when I start my ride, but quickly turn into a cold drizzle or a full-on downpour. Couple that with changing elevation (long, winding climbs where you quickly overheat, followed by chilly descents), and it can be hard to find the perfect piece. When paired with a summer-weight jersey and a pair of arm warmers, the Transparente 3 is pretty much my go-to setup for 80% of my rides. When the Gabba is overkill, this wind jersey light jacket does the trick. The high collar and Gore Windstopper front offer good protection from the elements. Throw a rain jacket over the top and I can ride comfortably down into the mid-30s. Solid piece from Castelli.